Hoping to take Ball's Ford across Bull Run unopposed, Colonel Krzyzanowski urged his men on through the light woodland towards the ford at their best pace. In skirmish order, there was a momentum and a sense of purpose to their advance over the rough terrain, but as they neared the ford and the first shots cracked out, it was obvious that the Boys in Grey were already awaitin’. This is part 2 of bringing a small slice of action from a boardgame to the tabletop. We are using Black Powder rules and the ACW supplement (Glory Hallelujah) with just two brigades against one on a small table, which of itself as an exercise brings some interest for these rules that are designed for bigger battles. Background story - In the boardgame (2nd Bull Run 1862) a couple of Union Brigades have just managed to get across Bull Run at Lewis Ford, located just below the stone bridge, but they are in bad shape and hard pressed to both sides by fresh Confederate brigades. Brigadier General Schurz directs two of his brigades ( Schimmelfenning and Krzyzanowski) to take Ball’s Ford, just below this position, taking the pressure off Gibbon and Taylor. higher up, but are vulnerable. Bull Run is a steep sided waterway and can only be crossed at the ford. A single Brigade of Confederate infantry (Gregg) stand in the way. The previous post describes the boardgame situation in more detail and explains what happened in that play and how this scenario was constructed around that situation (link in the Resource Section below). I played the scenario earlier in the week to iron out any wrinkles, so this is a second playing. The updated scenario is presented as a download in the Resource Section below. Turn 1. (Late morning - 2nd July 1862). Gregg, had lined Bull Run with his regiments, while McIntosh’s 6 pdr artillery battery had travelled down the road and set up directly on the mouth of the ford. 1st South Carolina were held in reserve behind the artillery. Sited on the edge of the woods (i.e. also on the banks of Bull Run), the brigade could claim cover from the woods (unclear target), but would not suffer a fire penalty for firing due to them being at the woods edge. By contrast, the approaching Union, if they fired, suffered a fire penalty until they reached the woods edge on their side of Bull Run. The Confederate position looked formidable and surely just getting into position would cause the Union grief. With the entire table covered in light woodland and Ball’s Ford being the only crossing point for Bull Run, this was a hugely restrictive battlefield, making it harder to move around and providing plenty of cover for units. Schimmelfenning (left of road) and Krzyzanowski (right) advanced quickly on either side of the road in skirmish order, while their artillery batteries were forced to remain on the trackway. L Battery under Captain Roemer got to the ford but remained limbered while the best firing positions were determined. They were right in front of the Confederate guns, but Roemer seemed to lack a sense of urgency in deploying. There was not enough room on the road for both Union batteries to deploy, so Hampton’s battery was held back in reserve. The Confederates held their fire until a continuous band of enemy blue stretched right across their front, along the woodland edge. The first volley disordered most of the Union, but on their far left, 61st Ohio was hardest hit, taking heavy casualties, shaking them. reach the edge of the woods. Fire-fights opened up all along the line, with exchanges between both sides of Bull Run. Amazingly, the Confederate artillery at the ford failed to do any significant harm to the Union artillery at the opposite end of the ford, allowing them to unlimber and deploy, but the Union infantry were not so gently handled by the Confederate regiments, they took the brunt of the casualties, leaving three of their regiments disordered. [notes - die rolls of ‘6’ not only inflict hits, but automatically cause disorder, so there can be quite a lot of disorder in a game]. The Union found their feet and started to return effective fire. In particular, 61st Ohio, laid down ferocious fire against 13th South Carolina, no doubt in retribution for their own suffering when emerging at the woods edge. The artillery duel was having little effect as each side cowered from the other. Turn 4. The fire-fights settled into an attritional style action, with the effects of disorder and the cover of trees significantly reducing fire effect. [notes - disordered troops get a -1 on their fire (bad) and can’t be given orders which prevents movement]. Turn 5. Krzyzanowski’s 75th Pennsylvania start to form up on the road behind their artillery in readiness for the almost certain order to attack across the ford. [notes - all of Krzyzanowski’s regiments have the ‘Uppity’ trait. This means that they are more inclined to charge into the face of the enemy than perhaps those of a more experienced nature might do, so in this scenario it makes sense to have the ‘uppity’ boys make the initial charge across that ford]. Turn 6. The 75th fail to advance as instructed, perhaps the enemy guns still looked too intimidating, as their cannonade tore into the Union artillery, shaking them. Union artillery is shaken and disordered. Schimmelfenning’s 8th Virginians move into position behind the 75th to ensure the assault kept its momentum. At 3 hits, Confederate regiments become shaken. Getting the worst of it, three of the Confederate Regiments became shaken and on the casualty aspect alone, the Union were starting to get the upper hand. [notes - Once units become shaken, break tests start, which can see units become non-combat effective. In standard Black Powder, failed tests lead to unit removal, in Glory Hallelujah, units instead become ‘Whipped’]. The Confederates should have pulled back into the woodland by now, but they got caught up in trying to inflict casualties and left it a bit late to disengage and now with several units disordered, getting things to moving proved difficult and those lingering disordered units then just took more casualties themselves. At last the 75th got the order to charge, but they immediately became entangled on their own gun positions and their advance stalled, which in turn stalled the 8th West Virginia behind them. 14th South Carolina (just to the right of the Confederate artillery) took heavy casualties and fell back ‘whipped’. With his brigade strung out along the waterway, Gregg had some difficulty getting his orders out, as evidenced by 13th South Carolina (far right flank), who went into skirmish formation ready to move out, but did not actually receive the order to get moving. The Confederate gunners totally failed to take advantage of the ‘pile-up’ that was happening at the opposite end of the ford. Turn 8. For the Union, the total chaos at the Ford saw the 75th Pennsylvania and 8th West Virginia stuck behind the artillery, but it was probably fortuitous as the Union artillery fire escalated in volume and destroyed the Confederate artillery. With the artillery gone and the rest of the Confederate line pulling out, 1st South Carolina, who had been stationed as a back-stop behind their artillery were ordered to advance to the edge of the ford. They were to provide the rearguard while the rest of the Brigade pulled back, but they failed to move ...... Ball’s Ford lay open! [notes - 1st S.C. failed their command roll and are too far from the enemy to use an initiative order, so they were not be able to manoeuvre this turn, but could still fire - though at a penalty for the trees]. Again the Union failed to get their infantry over the ford. It was an opportunity lost, giving 1st South Carolina a chance to get into the old artillery positions. The Confederate right had successfully disengage into the safety of the woodland, but on the left, two disordered regiments were still stationary and taking fire. [notes - 1st S.C. are ‘Tough Fighters’ in the scenario, which will allow them to re-roll a failed die in close-combat, they are just the troops to defend the ford]. At last! 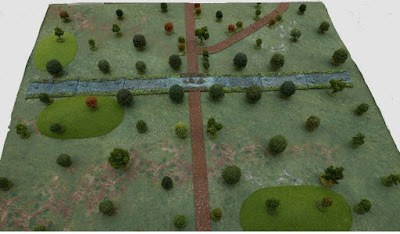 75th Pennsylvania started to cross the ford and the left wing (Schimmelfenning) abandoned the bank of Bull Run and moved across towards the road, ready to follow up the expected advance at the ford. As the 75th got their boots wet, they were hit by a hail of musket fire, taking casualties and becoming disordered, bringing a pause to the attack. they get their boots wet! [notes - The scenario was tweaked, moving it from a 6 / 7 turn game to 10 turns, thus the game ends and the question of victory must be decided]. Conclusions - After first testing this scenario as presented in the previous post, I changed the conversion from halving BP distances to instead converting inches to centimetres. This was not because of table size problems, but rather because it became easier to mentally handle movement and weapon ranges. For example infantry move 12”, so I had them moving 6” and then this would be halved again in woods, whereas by just using a centimetre tape measure, it would be a single halving for that movement and artillery close range and half range become easier translations, only by a small degree, but it helped this easily befuddled brain. The main change came in making this a straight 10 turn scenario, longer than the typical BP scenario, but necessary because of the much slower drip-drip effect of casualties and slow movement due to all of that protective terrain. Despite not getting their troops across the ford, the victory went to the Union based upon casualties alone as outlined in the scenario victory point schedule. They had managed to destroy an artillery battery and two Confederate regiments were ‘whipped’, giving 4 Victory Points. If we look at the overall situation, the Confederates were retreating, incapable of any offensive capability and close to the brigade breaking, while the Union on the other hand were certain to cross the ford (eventually!) and could prosecute their attack beyond, so this makes a Union win further justified. It was surprising that the Union 2nd Brigade did not suffer more with that stamina rating of 2 and this was perhaps the ‘luck of the dice’ thing, which saw the fire-fight advantage turn from the Confederates to the Union around turn 3. The artillery duel could have been more effective earlier for one side or the other and the Union intention to get infantry attacking across the ford was persistently thwarted, another area in which a replay and happier die rolls could make the difference. Overall, the scenario seems to be working and gave an interesting battle, during which most of the firing and manoeuvres felt like they mattered, creating player tension as the dice tumbled. Bearing in mind, this scenario fell out of a situation created on a boardgame, I doubt that my own imagination would have created a battlefield totally filled with woodland and a waterway with just a single crossing point, it seems like it shouldn’t work that well, but it did. Perhaps just by being different and throwing up challenges, the player engagement was enhanced. The rules seemed to cope admirably anyway having regard that this was a 4’ x 3’ table with just three brigades in play. The ability to use artillery in this terrain was difficult, but possible, so I left the guns in the Order-of-battle, which should have been to the benefit of the Confederates, who can set up with the guns already sited to strike fear in the hearts of those who might try to charge them. For the Union, their guns ultimately became a block to movement, making it difficult to exploit their eventual victory over the Confederate cannons. The Union will typically take fire as they approach their side of the waterway and form back into line for effective firing. I decided that the purpose of skirmish order in this scenario was all about manoeuvre over difficult terrain, rather than to interfere with the enemy, so I reduced their fire value to 1 while skirmishing to encourage a return to line when appropriate. I managed to forget the Jackson special rule that would have given Gregg a one-off chance to re-roll command dice, perhaps in turn 8 when 1st South Carolina failed to move up to the ford, leaving it exposed, would have been a good time to use this. For alternate battle plans, the Confederates could put more weight behind the ford instead of lining Bull Run and the Union could either pile their regiments up along the road to simply push, push, push across the ford, or perhaps just have Krzyzanowski do this because of his better command rating and that ‘uppity’ trait of his troops, while Schimmelfenning takes the bank to start the casualty process and support the troops trying to cross. Finally, at the end of play, I converted each successful hit into 40 casualties and this resulted in a narrative of the Confederates losing 600 men and a battery of guns, while the Union lost 280 men, again feeding into a justification of the overall assessment that the Union had won the battle. Link to the previous post that generated this scenario. Link to a downloadable version of the scenario. An excellent AAR Norm and, as always, interesting points made at the end re: what did and what didn't work. A nice looking scenario and a great looking game! Thanks Phil, I am intrigued enough by the situation to try it out with different rules. Fine narrative, Norm. Your BatRep pulled me right into the action. With Victory Conditions at present, could the Federals claim victory by never tackling the problem of crossing the ford? Simply standing off and blasting the Rebels seems a viable approach. Hope to see TF-ON in one of your planned replays. An interesting point regarding scenarios such as this. Having the Confederates deployed away from the river/ford in the hope that the Union troops could not get through the woods and across the ford in the requisite number of Turns would make for a rather dull game. This is where the boardgame bit comes into its own, as the larger scale implications of this could be played out in the next game. Sadly I've seen this sort of game played at a club by rather 'competitive' players. Not fun to watch or play in and frankly spoils an evenings gaming. Steve good point. The fight would still take place, but at the ford alone and likely starting no later than turn 3, but I think it rather an academic pursuit rather than something a friendly face-to-face game would benefit from. The terrain has created a tough situation, but the position should (I imagine) in real life be able to be forced, so what would interest me is whether the rules would allow such a thing or whether one set would and another wouldn't etc. The boardgame of course takes the thing in the whole, in fact it has a turn equalling 3 hours, so a hold load of nuance is somewhat glossed over or abstracted into a single and final result. Very nice!! What size/brand figures did you use? They look great! Thanks. The figures are by Kallistra and are best described as 12mm. They remind me of the very early 15's, which were smaller in their day than they are now. There is enough difference between them and 10mm that the two scales would not work together side by side, but the Kallistra ACW listings are complete anyway and 10mm buildings work well with the scale. As an aside, a small part of my Union army is out of action at the moment while I do a test re-basing to 30mm bases (from 40mm). the idea being that a 3 base line of 90mm might be a better fit into my 100mm hexed terrain than 2 x 40mm = 80mm does and importantly look better when using columns on roads etc. Of course, outside of the hexed environment, I favour 3 x 40mm bases for the unit, but could get the same effect with 4 x 30mm bases if need be. They look great. I was actually looking at Kallistra (many are in strips) or Pendraken. Thanks again. I liked your notes interspersed in the battle report. Thanks Peter, because I did most of the ground work in the previous post, it allowed me to just concentrate on the AAR instead of one huge combined post, perhaps that is something I should consider doing a bit more often. Small scenarios can still make good games if the situation is interesting. A higher level board game is an interesting way to generate them. You could probably run the board game battle for a year playing out interesting situations as miniatures games! Thanks Ross, as a result of the enjoyment that I got from this exercise, I would like to do a bit more of this sort of thing. being a big fan of WWII tactical games, that sort of thing seems ripe for such conversion. Overall an excellent post and interesting series. Thanks Stew, as well as the usual command stuff, there was one Blunder command roll for the Union, but it took them in the right direction, so was absorbed by the AAR. I agree, that one tends to get more enjoyment from gaming if one plays the same rule set more consistently instead of always trying to learn one. Which rule set is all down to personal taste of course, and BP does have a strength there in that no matter what genre you’re doing you’re still playing BP. Thanks Andy, it was a lot of fun to research and then play out. Interesting,clear and precise AAR. It's not what you would normally come up with so shows the benefit of the boardgame/wargame crossover and always nice to see some 28mmfigures! Thanks Iain, it is certainly something I will do again. Yes, the 28's are nice. I have enough bare plastic to paint up and do this scenario, the temptation is strong!